By Steve LaMontia, Director of Communications(Photos courtesy of satexans.net and Susan Griffin) Henry Esparza plays for the Texans in the San Antonio Men’s Senior Baseball League. He is also a very lucky man on a couple of levels. First and foremost, his wife saved his life last summer. Henry was experiencing weight loss and fatigue back in August of 2017 but brushed it off, as we macho ball players tend to do. His blood work was good so he tried to simply work through it. He is a workout maniac and continued to do so but nothing was helping. Then in September his symptoms got worse and his wife insisted he go to the doctor, which he did. That night he was in the hospital and was told that he was within 48 hours of dying. Henry had a rare kidney ailment and suffered from auto immune disease. His own body was attacking his kidneys. That began a three month regimen of dialysis and chemotherapy, as an exceptionally fit Henry went from 195 pounds to 157. Henry was then put on the kidney transplant list, which potentially requires a painful emotional and physical wait of up to ten years. 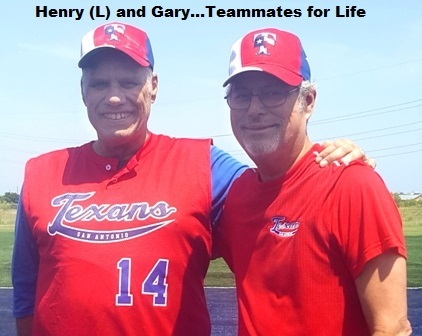 On May 18th of this year Gary and Henry were involved in what is known as a ‘kidney exchange’ that involved ten people. Gary wasn’t an exact match to Henry but was very close. But his kidney was an exact match for someone else who could better match Henry and so it goes on down the line. This procedure is becoming more common and literally involves taking one kidney into another room for installation. Many people were saved in one giant procedure at the same time. Henry concluded, “In further reflection I would say to all to relish the relationships they will foster and cultivate. You will meet some of the greatest men in the country. Men of character and passion for the game we love but also for life. You never know, you may meet someone who may save your life!